Megastar Amitabh Bachchan prayed for veteran actor Kader Khan's well-being and recovery on Friday, after several media reports stated that he has been admitted to a hospital in Canada for breathlessness. "Kader Khan, actor-writer of immense talent, lies ill in hospital. Prayers and duas for his well-being and recovery. Saw him perform on stage, welcomed him and his prolific writing for my films, great company, a Libran and many not know, taught Mathematics," read Big B's tweet. News agency PTI, after quoting media reports, stated that Kader Khan, 81, has developed breathing issues and the doctors have transferred him from a regular ventilator to BiPAP ventilator. Kader Khan' son Sarfaraz and his daughter-in-law are reportedly by his side. Later, Big B quoted a tweet of one his fans on Twitter, who posted an old picture of both the actors and wrote, "Prayers and duas." Read Amitabh Bachchan's tweets here. Amitabh Bachchan and Kader Khan worked together on films such as Do Aur Do Paanch, Muqaddar Ka Sikandar, Mr. Natwarlal, Suhaag, Coolie and Shahenshah. As a screenwriter, the duo collaborated for films like Coolie, Amar Akbar Anthony, Muqaddar Ka Sikandar and others. 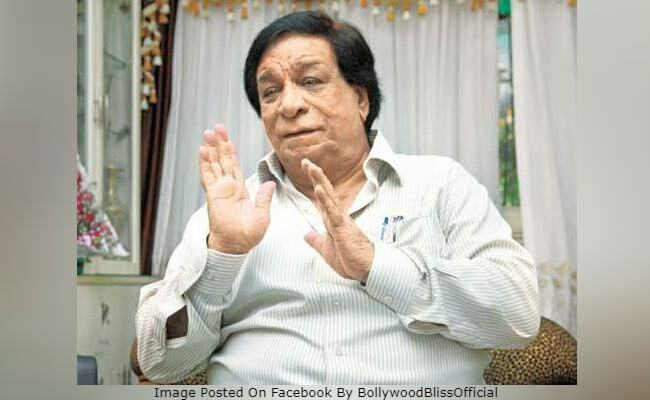 Last year, unconfirmed media reports stated that Kader Khan has moved to Canada for medical treatment. However, later, Fauzia Arshi, director of his last film Hogaya Dimaagh Ka Dahi, told news agency IANS: "He (Kader Khan) has been in Canada since three to four months. He is alright. He is in Canada because his elder son stays there, so he is with him. There's nothing like was he rushed to Canada or anything of that nature. Everything is fine." Kader Khan has reportedly been in a wheelchair after getting knee surgery in 2015. In April 2016, rumours that Kader Khan had died went viral. However, a source close to the Khan family revealed that the reports were untrue. Later, Fauzia Arshi told the press, "All these tweets and posts are rumours. He is very much alive. I would request all to stop these rumours." Born in Kabul, Afghanistan on October 22, Kader Khan is known for his work as an actor and a writer in numerous films. He has worked with directors like Manmohan Desai and Prakash Mehra. He has featured in over 300 films.